3D Gaming. Of course, this is the biggest draw. A 3D screen with no glasses has been the holy grail of 3D media entertainment for over 60 years. Has Nintendo, a gaming company known for its frugality and fun-over-graphics mentality finally broken through that wall? Well, nothing was demo’d at their press conference (seemingly because the screen won’t translate 3D to cameras), but early reports filing in (linked above) say it is indeed legit. Could the front facing camera on the 3DS actually allow you to touch, and receive a response to the 3D images on the screen? Could that persistent feeling of “I can almost touch it!” finally be lived? 3D On, 3D Off. This was my biggest concern of a 3D console, and it seems Nintendo finally learned from their errors on the VirtualBoy. 3D needs to be an option, not a standard. My son loves going to 3D movies, but he does not like the weird feeling he gets for about a half-hour after. Now, that only happens once a month or two, when we go see Shrek/Dragon/Alice, but could become a daily occurrence with this system. Thankfully, he won’t need to suffer through that every time he plays. Real World Implications. Alright, time to take the fun out of it, and talk about the educational aspect…Hey, that’s what I do here! Studies have shown time and time again that students learn abstract concepts better when presented with a 3D model of the idea. Take atoms for instance. You can explain until your blue in the face what a neutron, proton, and electron are to 10 year olds; or, you can have them make models out of colored marshmallows. Same concept applies here. Instead of trying to render a world in pseudo-3D (meaning the way we play now with “3D” graphics which are really 2D objects shaded to appear 3D), you can actually, faithfully recreate entire 3D worlds as they are seen in real life. Because of the 3D camera, you don’t even need to limit yourself to 3D CGI renderings.Take Pokemon, for example. Yes, you can explore a pre-rendered, studio-created 3D world and have Pokemon jump off of the screen in 3D. But why? Why not activate your 3D cameras, go outside, and start exploring your bushes and trees looking for Pokemon in the real world, and not just artificially placed on a 2D translation of a 3D plant in front of you. They can now move and jump on either the X, Y, or Z axis, and you can interact with them as such. What about Trauma Center? Sure, it gives you an idea of what surgery is like, but, again, on a 2D plane. Now, you can perform full surgery in the game by actually exploring the body in its true 3D reality. Students can explore space in 3D, and start being able to truly understand the comparable size and relationship of all the objects in space. Students can explore plant and animal cells, manipulating their properties, all in 3D. The 3D craze is hitting education, and rather than plunking down $6,000 for a 3D projector for use on a computer with nary a 3D piece of content in sight, why not put a 3DS in their hands, and let them explore the world around them. Because of the 3D camera, you don’t need to wait for someone to wake up and create content. You can create the content now. Every year in 5th, my students and I created clay models of an animal cell. They looked great. But, with the 3DS camera, we could have taken a picture of them, and then manipulated them in a 3D landscape allowing us to truly understand the structures and their purpose. Much like Photoshop lets you remove pieces of a 2 dimensional photograph, there needs to be developed a 3D Photo editing program that lets you “pop” out certain objects (take out the mitochondrian, and see what happens!) with ease. Adios, Kinect! I’ve made my feelings about Kinect known already. 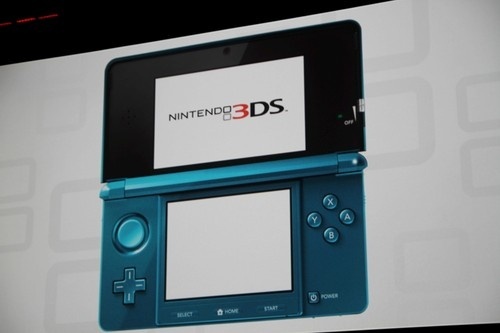 But, I think the 3DS finally solidifies that. With Kinect, you use a camera to track your movements. Great. However, those 3 dimensional movements are then translated, converted, and warped into a 2D rendering. With the 3DS, your movement is tracked (and, though it’s not been an official feature announced, the video above of an actual DSi game already proves it’s been used), and faithfully recreate that on a 3D screen.”Analog” or “Avatar” are words that no longer apply. Those imply that you are in control of a facsimile of your true self. The 3DS has actually created a symbiotic relationship between gamer and game, where both exist together in a mutual space.